In many ways the karting genre has been forever doomed. That is to say, outside of the original Mario Kart series. No other game has ever managed to step out of the shadow cast by the title that established it, or the sequels that propelled it forward. This in itself is quite odd; no one would call Bioshock a Wolfenstein 3D clone, or dismiss Forza as nothing more than a glamorous version of Pole Position. But most genres have evolved and outperformed the titles that originally defined them, and these originals have ceased to be the influential names they once were. Kart racing is different. Mario is still on top, and like every other karting game ever made, the challenge Walt Disney World Quest: Magical Racing Tour faces is to define itself as something more than a slightly worse version of Mario Kart. There’s no denying that Walt Disney World Quest: Magical Racing Tour succumbs to many of its genres tropes, but the game still manages to deliver a degree of originality. Even then, a straight up Mario Kart 64 clone doesn’t necessarily mean a bad game. Crash Team Racing proved that shameful rip-offs can still be super fun. Note: I’m just going to start calling this game Disney World Quest to make this easier for everyone. 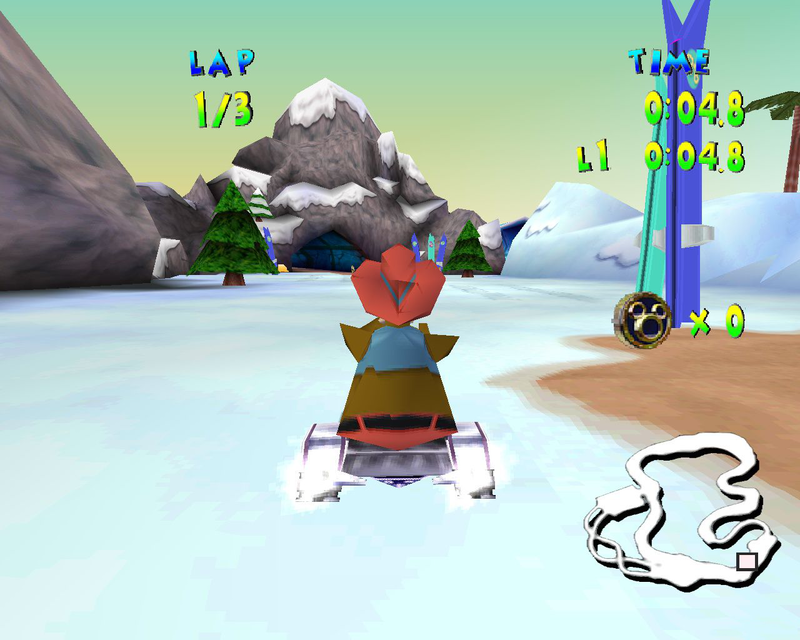 What setsDisney World Quest apart from competitors is the game’s imaginative tracks, although in terms of kart control it’s also fairly unique. Racing is fast, yet rarely frustrating thanks to a generous handling model where the vehicles stick to the track and turn quickly with great precision. As you’d expect there’s a drift/powerslide function (complete with bunnyhop) mapped to the right trigger, and this allows for sharp, right-angled manoeuvres that let you take the corned at speed. It also enables a slight turbo boost – this is even easier to activate than in similar games that are also available. After a few races to get use to the mechanics, there’s no doubt that Disney World Quest feels great. It’s fast, responsive, and extremely fun. The Dreamcast’s analogue stick also lends itself well to the tight controls. I perhaps picked up on this in particular after playing fair bit of Lego Racers last week, a fun game that (at least on PlayStation) is really let down by some awful digital controls. Disney World Quest was released in the year 2000, and it’s easy to take for granted so many things it does right when many of its contemporaries were making up the rules as they went along. TheDreamcast release has a few further advantages. Although SEGA’s final console was of the same generation as the PlayStation 2, GameCube and Xbox, it was released a few years earlier, and is inherently more retro than these later machines. Many games from the PS1 and Nintendo 64 were ported over, and the Dreamcast library now holds the definitive version of many multi–platform titles. 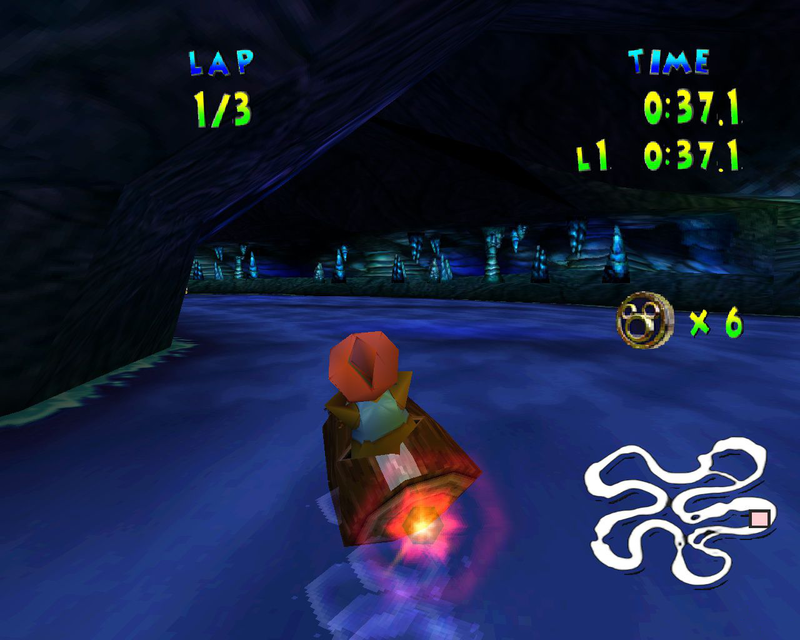 Disney World Quest is one of these games, having appeared first on the PlayStation. The Dreamcast outperforms it in graphic fidelity, and using the VGA output you can still get a crisp and impressive image on a modern TV. The main bulk of Disney World Quest’s content is found in the game’s adventure mode, which includes a story that if you’re over the age of twelve you’ll probably want to ignore. Narrative has rarely made a racing game great, but thankfully it usually doesn’t detract either. There’s a couple of cutscenes you may be inclined to skip, but after that you can get right into the good stuff. You’re initially greeted with a map of Disneyland and the selection of rides/tracks is presented. Although you can look over them, there’s only one you can race at first, with the others requiring progress to unlock. As you make your way through the game it’s a little unclear exactly when you’ll get these new courses, especially as they are ordered by location in the theme park, not by difficulty or unlock state. I was particularly looking forward to giving Splash Mountain a go, checking it every time I completed a race to see if it was selectable. It’s actually the last one you unlock. What’s really cool about the courses is their similarity to the real life Disneyland rides they are based on. This is not only in terms of look and feel, but sound too, with most courses using authentic music (the only downside here is the audio tracks have been shortened and the constant looping eventually gets irritating). Now I’ve not personally been to Disneyland for quite a long time, but even then I was struck by the familiarity of many of the locations. I’ve not been on every ride, and am certainly not qualified to give any extensive track/ride comparisons, but for me personally the Pirates of the Caribbean, Haunted House, and Splash Mountain courses stood out as excellent interpretations of their respective attractions. Two of these three tracks are water based, and whilst this isn’t why they’re my favourite, boat racing is also a great element of the game. Whilst each track requires you to use an appropriate vehicle, it’s only the land/sea variation that provides a noticeable difference in handling and track physics. The fun and varied racing at the heart of Disney World Quest is the obvious reason to persist against the game’s structural issues. Adventure mode is not only poorly presented, but tasks the player with confusing and illogical objectives. Your first task is winning races. This isn’t too bad, although the emphasis on first place means you’ll often be playing the same race again and again until you achieve the perfect run. Whilst the A.I. is never overly challenging, there’s no rubber banding. This means a bad crash often requires a restart, but when you’ve finally mastered the course it’s quite easy to win with a strong lead. Once you’ve managed first place you can turn your attention to two other challenges. One is collecting flying wisps (which is exceptionally easy as you don’t have to make the podium on the same run, meaning if you miss one you can turn around and collect it without penalty). The other is winning first place, again. I actually don’t mind an excuse to play the races a second time, although there’s no denying that this tour goal is unimaginative. After two wins trophy collecting is on the agenda. Eight cups are hidden across the track and these must be collected in a timed run, which requires understanding every shortcut, finding every trophy, and then working out a run in which you can collect them all effectively. The problem with this is it’s not very fun, and you can’t go back to a simple race against the A.I. until you’ve got them trophies. 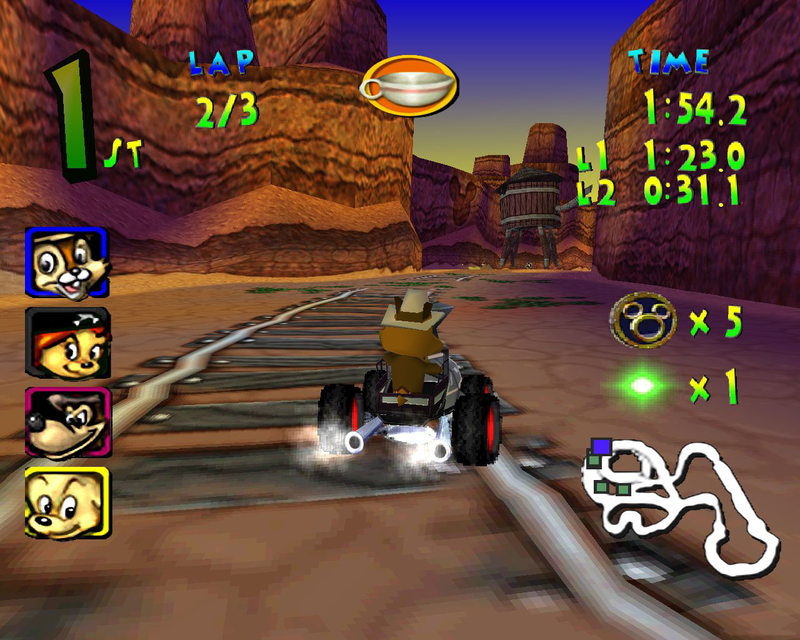 With no single race option, after two wins this is literally all you can play on the tracks you’ve unlocked, and you can’t do anything else until you’ve endured the tedium of trophy hunting. 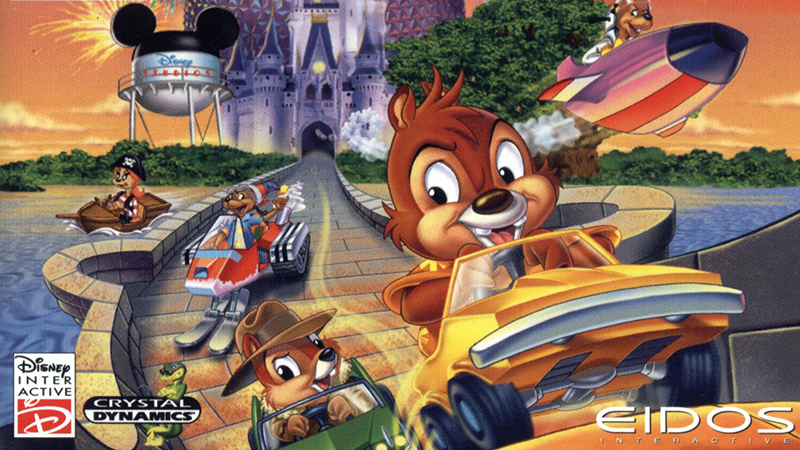 Of course it’s rare to find an obscure racing game that’s fifteen years old and call it perfect, but overall Disney World Quest is pretty good. The licensing is excellent, and there’s a unique form of enjoyment to be had for anyone who’s been on the real life attractions. Strong incentive to see everything the game has to offer makes the adventure mode worth playing through, and all the game’s flaws don’t change the fact that the tracks are awesome, the racing is fun, and Disney World Quest offers a unique tour of Disneyland you won’t find in any other kart racer.